One of the predominant issues in recent world news has been the current actions of the Islamic State of Iraq and the Levant (ISIS) and the tensions that the U.S. and Syria now face in response to those actions. The issue is not new, especially since the ISIS group has prospered since U.S. troops left the Syria and Iraq region in 2011, but the conflict has been escalating this year to a breaking point. This article will explain the origins of ISIS, detail the current state of affairs in Syria and Iraq, and explain the current political struggle the U.S. has in addressing this threat, including the legal implications of taking action against the group in Syria. As background, the Islamic State in Iraq was created by Abu Ayybu al-Masri in 2006, and was originally a part of al-Queda. The current leader, Abu Bakr al-Baghdadi, took over control after Abu Ayyub al-Masri was killed in 2010. The group then absorbed another militant group in Syria in 2014 and changed their name to the Islamic State in Iraq and the Levant (ISIS) in April 2013. In February 2014, al-Queda renounced all association with ISIS in due to months of infighting, and because ISIS was considered too violent. In March, ISIS started its military campaign by first taking over the Syrian city of Raqqa, and now currently controls territory in both Iraq and Syria. ISIS continues to terrorize parts of northern and western Iraq as well as parts of Syria. This undated file image posted on a militant website on Jan. 14, 2014, shows fighters from the al Qaida-linked Islamic State of Iraq and the Levant (ISIL) marching in Raqqa, Syria. Image Source: ABC News, AP. One of the unique tensions with ISIS is that many of their fundamental principles go beyond those held by other Muslims. ISIS believes that all of the Muslims in the world should live under one Islamic state which shall ruled by sharia rule. 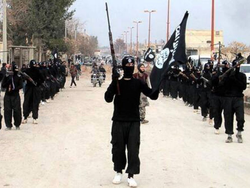 The goal for ISIS is to create its own Islamic State in the region between west and northern Iraq and eastern Syria. Their ruthless tactics have not only created tensions with Western States and Syria’s President Assad, but have also created tensions with other al-Queda jihadists groups like the Jabhat al-Nusra group who is now clashing with ISIS, and starting to fight against ISIS to slow down their progress. Despite efforts by Jabhat al-Nursa to slow progress, ISIS has continued to expand into Iraq and Syria. They have recently taken Mosul, Iraq’s second most populated city, as well as an oil field in Syria. Although the ISIS’ movement across the land is of significant concern to President al-Assad, the concern that impacts the U.S. is the mass casualties and humanitarian violations that ISIS commits every time it conquers another region. Some of the crimes included killing captured Syrian soldiers, killing Kurds in Iraq, and recently the beheading of American journalist, James Foley, which occurred in Syria. UNICEF estimated that the ISIS in now responsible for the displacement of up to 25,000 Yazidis and the death of 40 children. As a result of the tensions in Iraq, the U.S. has lunched airstrikes into Iraq to slow ISIS’s progress, but have yet to launch airstrikes into Syria because of the potential political and legal repercussions. One of issues with the U.S. potentially deciding to launch airstrikes in Syria is the potential legal ramifications. One of the issues is that Syria may not be able to fight the ISIS on their own, because their counter-attack is based only a mutual dislike of the ISIS by certain groups, like Jabhat al-Nursa. At this point, the U.S. does not have a stated policy on how they will proceed, but some now believe that the U.S. may choose to use force for Syria. One of the questions for an U.S. action may be whether there is a justification for use of force under international law. Part of the justification may be that the U.S. is using the threat to come to the aid of Iraq. Another justification would be to either use a Security Council Resolution or receive consent from Assad to use force. Depending on the political ramifications, the U.S. may decide to use either justification. At this point there situation appears to be at a standstill. President Obama appears to be weighing the potential of expanding the airstrikes into Syria. Part of the issue would be if the U.S. decides to strike that action could be considered an act of aggression against Syria. On the other hand, if Obama decides to work with President Assad it may be considered an act of support of Assad, something which could be difficult considering the allegations the Assad has been turning a blind eye to al-Queda fighters using Syria as a base camp for training. Regardless of what President Obama decides, this is an issue that will continue to be prevalent in world news until resolved. The key will be resolving the issue in manner that both protects the citizens at risk and ensures that tensions between the U.S. between Syria do not rise more than that in a manner that is legally justifiable. Katelin Wheeler is a 4L at the University of Denver, Sturm College of Law, and Business Editor for the Denver Journal of International Law and Policy.